Simple mistakes can throw your weight loss plan out the window. If your weight does not budge on your scale or bounces up and down, check out the following list to see if you are making any of these mistakes. 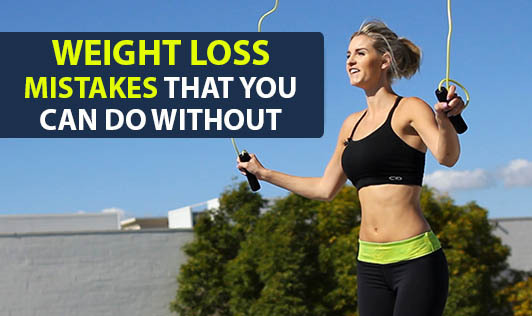 Crash diet - Drastically reducing calories thinking it might help you to lose weight faster. Skipping breakfast - You might think that breakfast is not an important meal and that you can make up for it at lunch time. Unmindful snacking - Munching on high calorie foods without realizing what you eat. Overeating low fat/ low sugar foods - Foods labeled low fat or low sugar might tempt you to eat more than required. Drinking less water - can lead to dehydration and lowered metabolism. Liquid calories - Beverages like fancy coffees, alcohol with soft drinks, fruit juices with sugar, are all laden with calories though they might not seem heavy on the stomach. Skipping exercise - due to lack of time or energy or motivation. Checking your weight daily - can get de-motivating on days when the scale shows no difference in weight. Stress - can lead to unmindful eating or bingeing on unhealthy foods. Setting unrealistic goals - wanting to lose large amounts of weight or fat consistently and expecting similar results each month. Avoid these mistakes and follow the guidelines set by your dietitian. Clarify all your doubts to avoid confusion.